Coming to An Giang, not only that you will discover the beautiful terra with countless of sightseeing destinations such as Châu Đốc Lady Pagoda (Bà Châu Đốc), Sam Mt, Cấm (Forbidden) Mt, the magnificent Mt, but also the amazing cuisines of the Chăm, Khmer, Chinese, and Vietnamese people. Countless wonderful dishes are awaiting you to come and enjoy in An Giang. If you have a chance to come to An Giang, you should definitely try this one-of-a-kind dish. There are many places try to mimic this dish, but only An Giang can deliver the best quality dish. For many first-time eaters, the bitterness of the indica can be a trouble. However, if you chew slowly, the leaves’ bitterness will become a uniquely sweetness. Indica also called the salad tree (cây xoan ăn gỏi) in Vietnamese. Indica is a wild herb; the leaves are small and should be eaten when they are raw. The top of the herb tree is purple. The Indica can be made into many types of dishes: Braised fish with indica, braised pork with indica, or eaten with fish jam, distilled pork. The best of them all is the Indica salad. Collecting the early leaves and the flowers, the chef will clean them and soak the leaves and flowers with boiling water to reduce the bitterness. If you like the bitterness to be intact, you can put the leaves in ice so they can be a bit crunchier. After that, the chef will mix the leaves with boiled shredded bacon, steamed shrimps, dried fish, some slices of raw mangos, a few slices of cucumber, coriander and peanut. The most important part is the sweet-n-sour tamarind sauce. The Indica salad can be eaten with white rice, snakehead rice vermicelli, fish jam or the dangila. Eating a spoon of the dish, you will notice the fat of the bacon, the salty of the fish, the sweet of the shrimp, the sour of mango, and last but not least, the bitterness of the Indica. All are combined to create one of the most special dishes in An Giang. A dish likes no other. The grilled snakehead is one of the best dishes of the bucolic South’s cuisines. This is a dish which will make you forget how to say “no.” Using a stick to skewer the fish, you will need to grill the fish on the burning charcoal, not straw to have the best of it. Using straw is very difficult, and this technique requires expert hands to put in the right amount of straw. 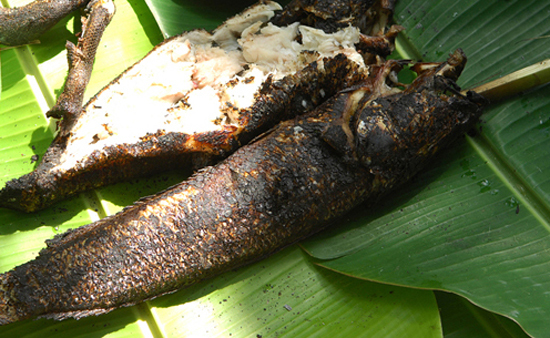 When smelling the burning fins, you will put the fish on banana leaves, use straw to clean the burning areas, cut the fish in half to see the white and tasty meat, remove the gut. 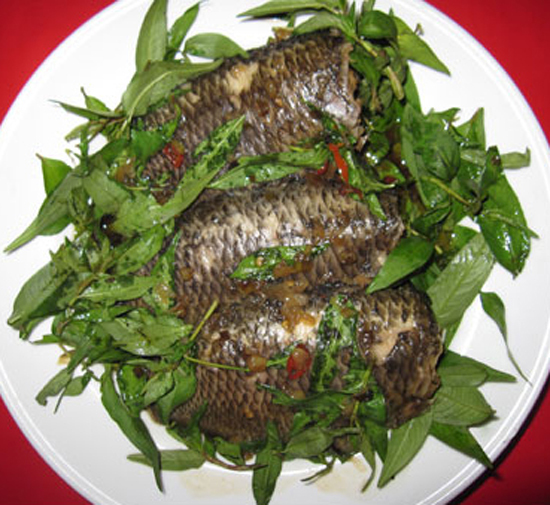 The fish is also served with tamarind sauce, and herbs such as sand dunes (cát lồi), two ladies (nàng hai), silk (lá lụa), lotus (bông súng), coriander, tamarind leaves. The best way to eat the fish is to roll it with rice paper, and dip in fish sauce to notice sweet and fat of the fish, the spicy of chili, and the bitterness of many types of herbs. The Hau River dolphins are flat, with blue-white color and big stripes on their skins. Their sizes are roughly three fingers. The best of them is the one with blue skin and red tail with the sweetest meat. When they swim and being caught, they make the sound just like the sound of the dolphin so the people live near the Hau River name this type of fish with the same name (they are completely different). The locals consider the fish is the cuisine of the rising-water season, and they turn the fish into many delightful dishes such as grilling with chili salt, making sour soup, making hot pot, or braising. The grilling fish can be dipped in fried broken rice with green chili, and eaten with herbs, lettuce, cucumber, pineapple, raw banana… The dish is a wonderful combination of the sweetness of the fish and the spicy of chili. 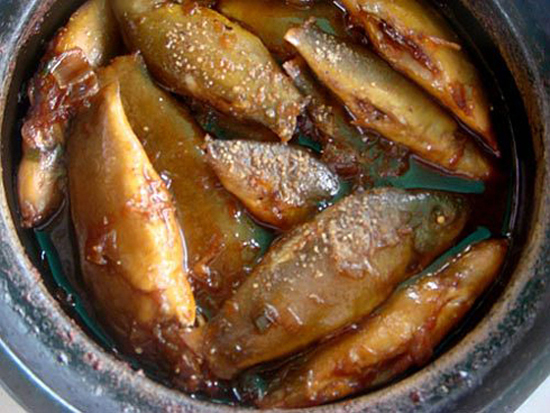 The fish hot pot is also exquisite when cooked with on special vegetable of the South, the Sesbania sesban or “bông điên điển.” The crunchy of the sesban, combined with the sourness of the broken rice, and the sweetness of the fish creates a very interesting dish. 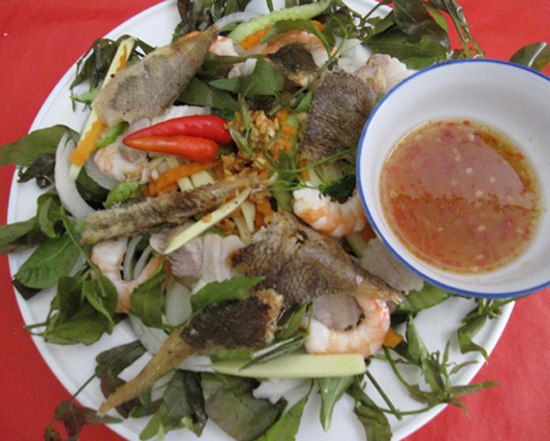 The sesban salad is fitted best with the braised early season fish with peanut. More complicated dish would be braised pepper dolphin, which has the spicy of pepper, the sweet of fish, the fat of bacon, and many flavors of many more ingredients. There are so many options from one type of fish. 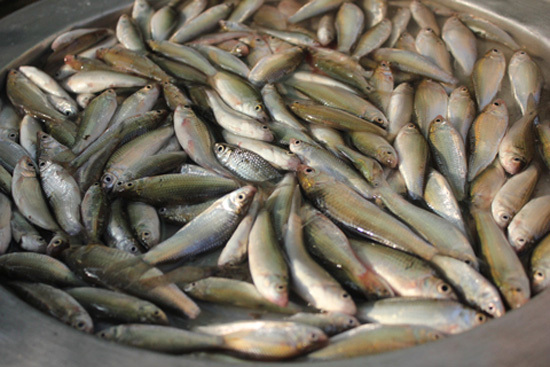 Perch is a freshwater fish lives in ponds, rice fields in the Mekong Delta, especially in the Chau Doc, An Giang region. The fish meat is sweet, fat and easy to cook into so many delicious dishes: braised perch, grilled, deep fried… and the best and the simplest is the braising technique. The braised perch is eaten with white rice and steamed herbs with braised fish sauce. The sweet and fat braised perch combined with the strong flavorful herbs and white rice will make cannot stop eating. 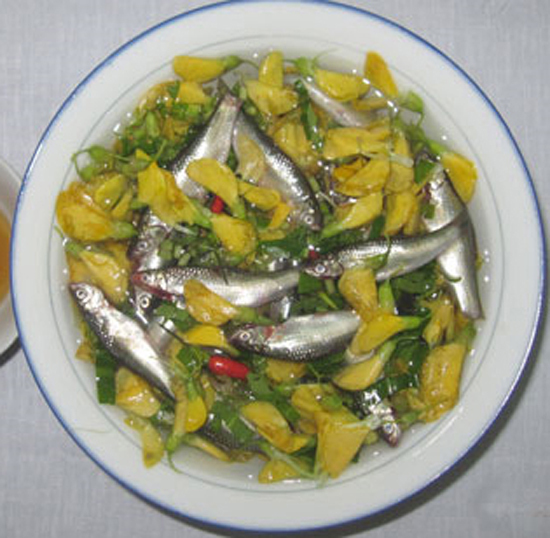 Whoever comes to An Giang in the rising season will know about the famous Sesban sour soup. The main ingredients are the sesban, lotus branches, tamarind, herbs, chili, dangila fish or perch. 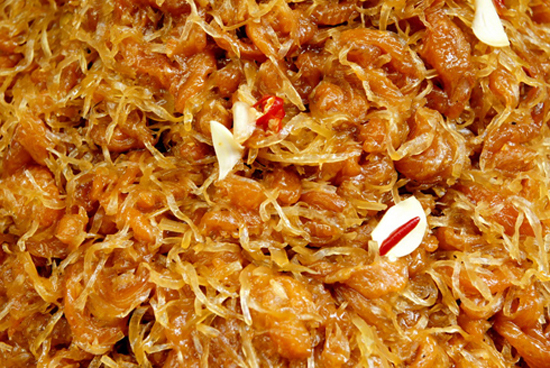 The sesban has to be picked during the early time of the flood season, which is sweet and fleshy, with a yellow color and a dishtinghish smell. Eating the soup and you will never forget the sweet of the vegetable, the sour of the tamarind, the additional sweet from the fish, and the spicy of chili. The vegetable is also used to fry shrimps, or to stuff the Vietnamese traditional pancakes. All of the dishes combined to make a nice and delicate banquet of the countryside which no restaurant can offer. In the midday of the flooding season, with the rains are pouring outside, there is nothing better than a bowl of sesban soup and a pancake. During the flooding season in the Mekong Delta, usually from late August, the dangilas, after laying eggs in the Lake Sea, come down to Tien (Tiền) and Hau (Hậu) Rivers to find food. 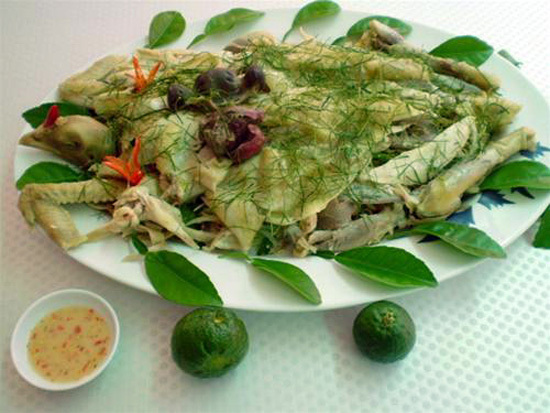 The locals have two famous dishes made of the fish: the fried floured dangila and the hot pot of dangila and sesban. The first dangila during the early of the flooding season is fat, soft, and you can even their bones. When cooking, you don’t have to remove the fins, just remove the guts, soak with salt water to remove the slimes and cook the fish. 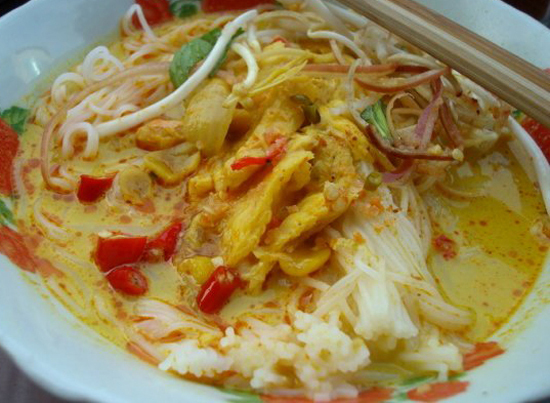 The best dish is dangila cooked with sour soup and eaten along with rice vermicelli. The sour soup is made of tamarind, herbs, cilantro, and basil. The fish, after cleaned and removed the guts, is put separate from the soup with the yellow sesban. When the soup is cooked, put the fish and the sesban into the soup together. The fish is soft combined with the crunchy sesban is a wonderful combination. Beside from the sour soup and the braised with tamarind, the dangila is also made into many other dishes such as vinegar-dipped dangila, fried floured dangila, sugar cane braised dangila, fish roll, fish sauce, and even canned. All are delicious, yet the cooked dangila eaten with herbs are the things you will never forget. If you have the chance to visit Chau Doc, don’t forget to try one the most peculiar dish, but probably the best dish in the region. The delicious fish jam, although simple, is definitely the symbol of the Southern culinary. The fishes used to make the jam usually are snakehead, fat catfish. After removing the fins, washing the fish, you need to soak the fish in salt water for 15 days. Then you roast the rice to make the flour to mix the fish. After 15 days, you remove the fish’s head, skin it, remove the bones, slice the meat into chopstick-like shape, marinate the meat with sugar, fish sauce, and mix the meat with sliced raw papaya. The papaya, after leaving under the sun for one day, is good to use. Putting everything together into one can, you will need to seal it so wind cannot get inside for a week. You also don’t want to leave the mixture in the can more than that period of time. The fish jam is a traditional delicacy of the locals, and the process to turn the fish into jam without cooking depends enormously on the skills of each food makers. 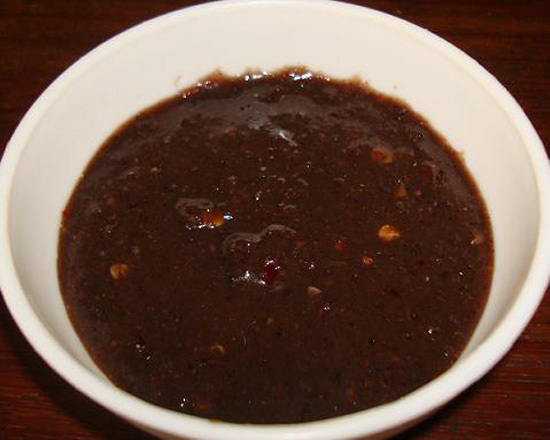 With the best skill in the jam-making business, the people in An Giang have the most famous brand in the country. Dipping sauce is a traditional business in An Giang, and the fish gut sauce, like many other sauces, is made by the best people in the business. The sauce, mixed with roasted rice, is good to eat for about three months. The sauce is made of the guts of the big fishes, even better if the fish has eggs. After taking the guts out, the cook will have to meticulously remove the fat cover outside the guts, but leave enough to keep the smell down. The sauce is eaten with herbs and chili. The sauce is also good to eat with bacon, duck eggs, with some pepper and some slices of ginger. If you like to have a hot dish, you can cook the sauce with lemongrass and chili, and eat with herbs. Coming to Sam Mountain of Chau Doc District, An Giang Province, you will have an opportunity to enjoy and fall in love with the famous seven-dishes of beef. The seven are boiled tripe, boiled meat with rice vermicelli cake, cow’s head porridge, grilled beef with bread, fried beef with Aganonerion, beefsteak, and roasted beef. Among the seven dishes, the chefs of Sam Mountain take pride in the fried beef with Aganonerion the most. The fried beef with Aganonerion is served with rice vermicelli. The dish is a combination of the sweet of the beef, the sweet sour of the Aganonerion leaves, the spicy of the pepper, and the fat of the peanut and coconut. The dish also has a special dipping sauce. The soybean sauce mixes with some ingredients and chopped lemongrass is the perfect companion with the fried beef. The boiled tripe is also a delicacy. The boiled tripe will have an ivory white color, and the dish is dipped with crab sauce with some garlic, chili, and lemon. Putting the tripe into the boiling hot pot, and dipping the slice of tripe into the sauce, you will instantly feel the crunchiness and softness of the gut, the liver, the lung of the cow. 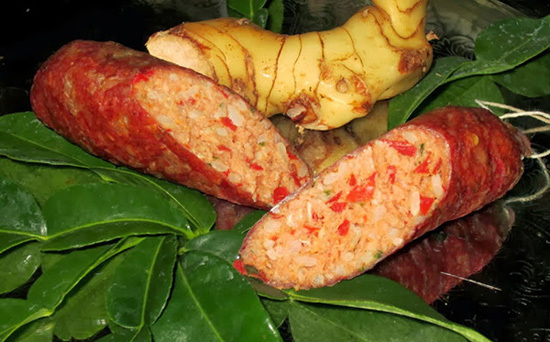 Tung lò mò is the Vietnamese-version name of the beef sausage. This is a delicacy of the Chăm Pa people in An Giang, who live concentrically in An Phu, Tan Chau, and Phu Tan Districts. There are two types of sausage: sour or normal. The sour sausage is made with rice, which is the ingredient makes the sausage has its sourness. The sour sausage is not easy to eat with the people who first tasted it. Unlike pork sausage, the beef sausage, after cooking, only needs to be dried and the sausage is ready to be cooked. You can fry or grill, but the best is to grill the sausage on the charcoal. After grilling, when cutting the sausage, you will notice that the sausage has pink color and a beautiful smell. The sausage, after cooking and still hot, needed to be dipped in soybean sauce. The sweetness of the grilled beef, the fatness of the fat, the sourness of the sausage, the spicy of the sauce, all are combined to create a wonderful experience. The sausage also needs some herb to be eaten with: cilantro, coriander, star fruit, raw banana, chili, and pepper lemon sauce. The sausage can be served with rice vermicelli or bread. Steamed chicken Bamboo leaves is a peculiar dish in Cam Mountain. Phyllostachys is the name of the Asian bamboo. Unlike the regular bamboo, this type of bamboo has bigger leaves, the bark is rougher, and the taste of the leaves is much sourer than lemon leaves. The bamboo leaves, sour and strong, are chopped and put on top of the boiled chicken or beef will create a very distinguish flavor. The chicken should be farm chicken, which is left outside. After cleaning the chicken, the chef will marinate the chicken with pepper, garlic, onion, fish sauce, and then cook the chicken using steam until the chicken turns yellow. In order for the chicken to have the special flavor of the leaves, you need to put the leaves under the skin of the chicken. When eating, you chop the chicken into smaller pieces and then shred the meat. The bamboo leaves are chopped and put on top. Under the chicken, you need to ready some herbs like raw banana, some slices of tomato, cucumber, and chili. Dipping a piece of chicken into the salt-n-chili dipping sauce and slowly chewing, you then now experiencing the fat and sweet of the chicken, the sour of bamboo leaves, the bitter of herbs and the spicy of chili. 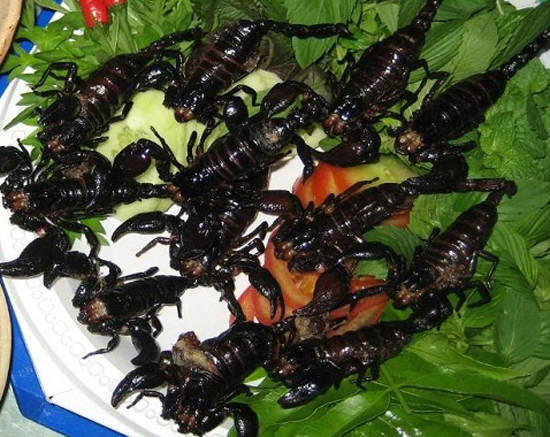 Coming to the two mountainous districts of Tinh Bien and Tri Ton, you should definitely try the crunchy fried scorpions. We all know how a scorpion looks like, and their venoms are very dangerous. They usually live in hallow trees, bushes and needed to be careful when attempting to catch one. You should definitely leave the catching to the professional and mind your eating business. After catching the insect, and leaving them for a few days so their bellies can be emptied, the chef will wash them again, and fry them on the frying pan full of oil. The fried scorpions also required some herbs to eat with. Some such as cilantro, parsley, and vegetables like tomatoes and cucumber, some pepper-n-salt lemon sauce or soy sauce will be perfect. Crunchy and tasty, the scorpions are fat and sweet. The best part is the belly, where beside the taste of the herbs, there is also a taste which no bug has. There is also the dish fried scorpions with butter, which is equally amazing. The scorpions are also used to make wine and according to the Khmer people, eating scorpions and drinking scorpions wine will have relieve pain, and enhance energy. 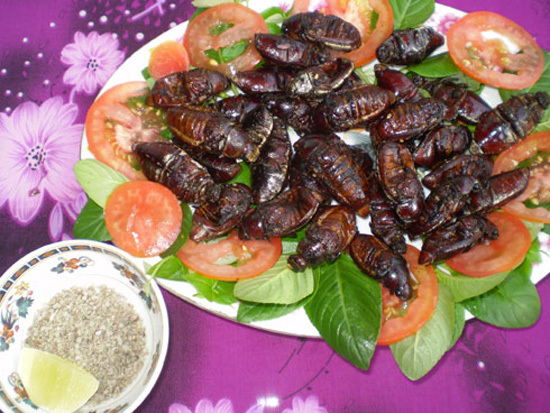 In the Seven Mountains area of An Giang, bugs are considered exotic and loved by many people. The bugs look very much like the beetle, the size is like a thumb, the color is brown, short, wings, the head and the legs are hard but the body is soft and round. The fried bugs are tasty and fat so many try to find them and turn them into delicious dish. Like crickets, lavas or scorpions, the bug only need to be cleaned, cut the wings, legs and removed the guts. After that, they are still need to be cleaned one more time using warm water with salt, and then marinated with sugar, pepper, garlic, and then fried with a lot of oil. If you want it to be more complicated, you can add in bacon or peanut into the bugs. The fried bugs are eaten with lettuce, tomatoes, cucumber and dipped in salt-n-pepper lemon sauce. Many tourists maybe terrify because of the shape, but you only need to try once to like the taste of it. Fat and sweet, the fried bugs in An Giang are like no other dish. Moi Market is famous for many agriculture products and cuisines. 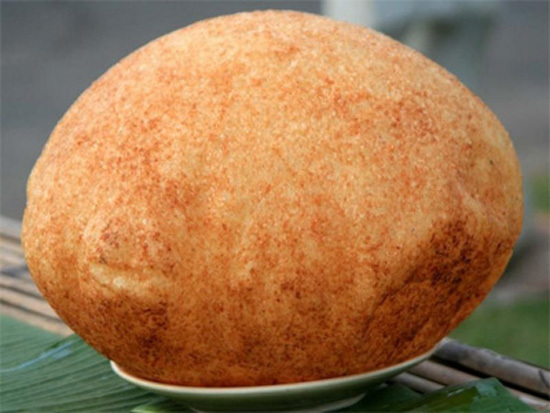 The fried sticky rice bubble is one of the most famous dishes of the market. The rice in the region, thanks to the red mud, is highly qualified with the grains are round, fat and beautiful. The fried sticky rice is yellow, and tasty. The main ingredient for the bubble is the sticky rice, but unlike many other types of sticky rice, the rice is smashed and mixed with sugar, pea. After the mixing process, the rice is fried until it has the shape of a bubble. The bubble has to be round, not to chewy, yellow and soft. The inside is also yellow. Eating the sticky rice, you can also dip the rice in chili sauce, soybean sauce. You can eat the sticky rice with fried or grilled chicken. The chicken meat has to be chewy and sweet, and have to be grilled manually. The shop Kim Huong of Ms. Hong Thu in Cho Moi Town is one of the best. Visiting Chau Doc, you should definitely try out the delicious broth rice vermicelli in this amazing land, otherwise, it would be a waste coming this far. The delicious broth rice vermicelli of Chau Doc has many characteristics: the broth is sweet and fat, the rice vermicelli is purely white. In order to have a perfect bowl of rice vermicelli, you will need: a big snakehead which is all cleaned and boiled. You will also need to remove the bone, and take a partial amount of the meat and grinded into dried shredded fish and flour. You will also want to fry the onion, garlic, fish curry powder, cloves, and cinnamon together with the fish. 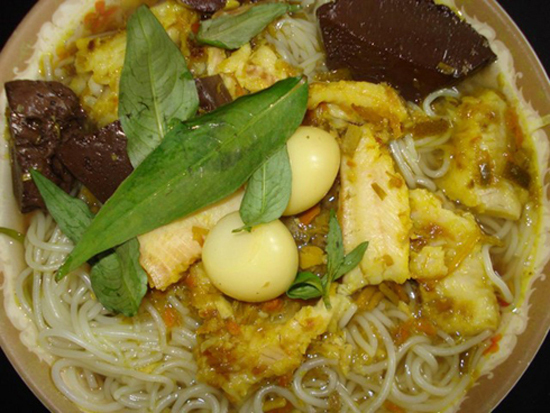 Combining everything with the fish broth, and marinating with the kroeung, a special ingredient of the Khmer, you will almost complete a perfect bowl of fish broth rice vermicelli. Adding in coconut milk, setting the fire to small, and finally adding in lettuce, raw Banana Flower, putting the rice vermicelli on top and pouring the broth in, and whoa-la, you have yourself a nice bowl of fish broth rice vermicelli. There is a bucolic dish in Long Xuyen City that tourists definitely try out once is the fish rice vermicelli. The bowl of fish rice vermicelli has the color yellow of the paddy fields snakehead meat, the green of slices of spinach. The secret to have a perfect bowl of fish sauce is the fish. You must pick a completely natural snakehead. The broth is cooked using the fish itself. When the fish is cooked, the chef will separate the head and the body. With the body, the chef will now remove the bones and fry the meat with ginger to remove the smell. The rice vermicelli is placed in the bowl, with some sliced Banana Flower. The head of the fish can be used as sweetener for the soup or you can eat it as well. The dish also needed tamarind sauce to eat with. 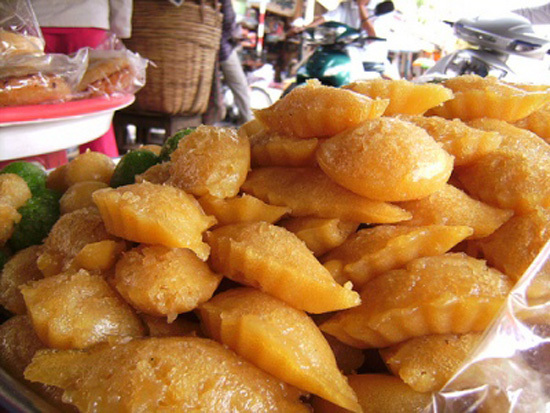 In Long Xuyen, there are many places serving the dish, but the best shops are located on Le Loi Street. From 12 to 9pm, this is the place for you if you want to enjoy a true fish rice vermicelli of Long Xuyen. The borassus in the Seven Mountains region of An Giang is famed for its fresh juice, sugar, and many other dishes made from this wonderful fruit. The borassus pie’s main ingredients are the borassus juice, the borassus fruit, and the Ms. Nhen rice. The pie is good because it is made of the special rice from the Seven Mountains and the thick and delicious borassus. The pie has a yellow color, smell delicious, sweet and fat which is suitable for dessert or present. The making process is simple. Smashing the rice, mixing it with coconut meat, borassus sugar, baking, and wrapping the pie in soong leaves which can only be found in An Giang and you will have nice basket of borassus pie. The traditional business of making the soft cake in Phu My have been around with locals for more than 70 years. 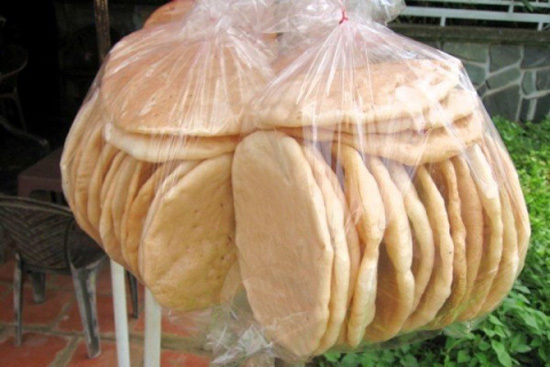 The soft cake of Phu My, small like a dish but can expand bigger than a hand fan when baked. The cake is soft, fat like rice, sweet like borassus sugar, and has the distinguish smell of milk, sesame, soybean, and peanut. 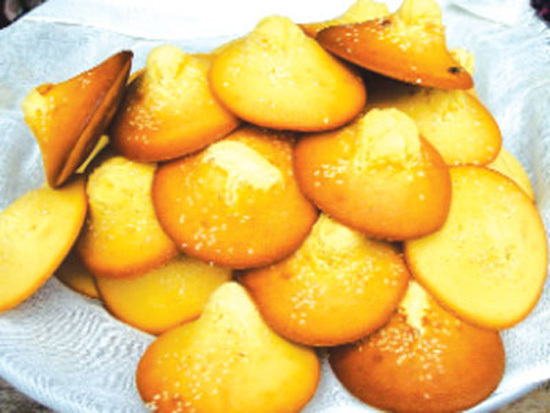 The cake is usually served in Tet holidays, wedding, and many other events. Biting, chewing and listening to the crust crunching in your mouth, you will soon realize that the inside is soft, sweet, and fat. The cake is sweet thanks to the borassus sugar, and fat because of the sesame. The Cham people, unlike the Vietnamese, use borassus sugar—a delicacy of That Son area, in most of their cooking activities, not the white sugar cane sugar. In the Seven Mountains region, the borassus is one of the most famous fruits. From cooking to drinking, it is everywhere. 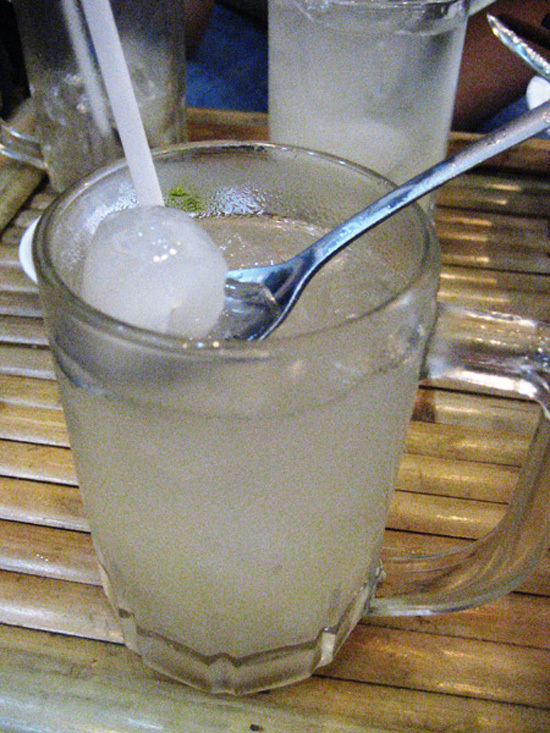 In a summer day, a cold drink of borassus fruit will help cooling any hot head down. In order to have that delicious drink, in the night before, the locals will climb up to the borassus tree, which is about 20m (6 ft.), using a sharp knife and cut open the borassus so the juice can run into a bamboo tube. The locals then will leave the tube stick to the borassus until the next morning, when they climb up again and collect the tubes. The juice is sweet, and most importantly, fresh. The borassus fruit is also brought down, and removed the meat. The meat is fat, and fleshy. 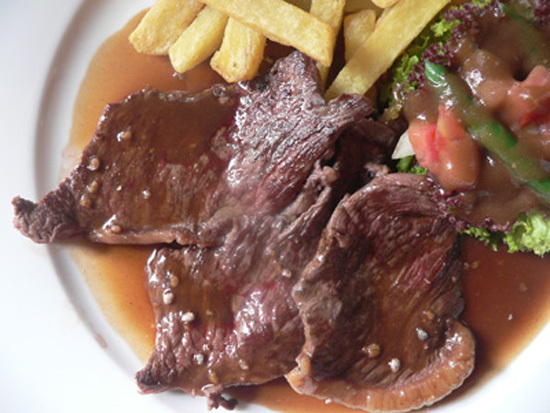 The iced borassus meat combined with the water is a perfect combination for a hot day.